Finding a job and preparing an attractive resume is one of the important stages of everyone’s life. But while preparing for an interview and resume writing, a person need to focus on certain elements of the professional resume format. Moreover, these professional formats of resume include educational background and professional background, but along with these two one’s personal information can also be considered as a part of the resume. How to Include Your Contact Information on Your Resume? While including personal information, a candidate must think of adding his contact details so that the company can contact the candidate if he is selected for the job, but here question is that which contact number should a person include in his resume. Such as residential contact number, cell phone number or office number (if any). Therefore, to clear out that confusion there are some tips given below. Most people consider using their cell phone number on their resume, and that is because they carry their cell phone everywhere with them, there won’t be any chance of missing such important calls. Using cell phones avoids the chances of getting lost in the process of interview selection. As people carry their cell phone everywhere with them, it is a quite convenient way of contacting someone anytime and from anywhere. Some people have a habit of keeping other number in case of emergencies, such numbers like when a person contacts to one’s regular number and he couldn’t get in touch with that person, then they should use those emergency numbers given to contact them if it’s something urgent. Therefore, it is always advisable for all the candidates that they should include a number which they give others when it’s something urgent and one cannot reach out through one’s regular number. It is very common that some people use their telephone number and cell number in their resume, in case of any personal and professional emergencies. But it is always better to use a number with voice mail facility because if one of the device won’t be available on call, then it should automatically allow the person calling to leave a message in case of emergencies. And once they are available on the phone, they can call back that person after receiving the voice mail precisely. There is a possibility that if someone important calls to one’s contact details given, and all of the sudden someone else picks up the calls it makes things uncomfortable for that person keep contacting to that number. Therefore, while including house or office numbers one should make sure that they only should attend those calls by themselves instead of others. And that is why it is better to provide a number which can be answered by the person who provided the contact details. It is advisable for most of the candidates that while writing a resume a candidate need to include their cell numbers instead of their house telephone number. The reason behind that one should avoid using home contact number because there is a possibility if one of the employer contact the candidate through their home number, then family members can mislead the employer and in that confusion the employer can reject the candidate without any such reason. It is a possibility that one person attended an interview and even the employer is interested in selecting him for the position. And when the employer finally decides to convey this message to the candidate by using his cell phone or other contact details, then the candidate needs to make sure that while answering and returning to that call the candidate need to be alone in the quiet place where there is no much noise and disturbance. Some people include their previous employer office number where they used to work before. And in this case, while applying for some other interviews or positions the candidate must not include previous employers’ office number. Instead of that the candidate should provide them the cell phone number or if one doesn’t have any residential number, then they can inform the employer to contact them through their Email address. There is a possibility that a person might be interested in switching his job and trying to attend the interview simultaneously while working with another company. Therefore, during that time the candidate need to include his desk official number and make sure that only he attended his office phone. If someone else attends his number, then the candidate should avoid including such official number on his resume. It is not necessary that a person need not include his home number in their resume, but while entering their home contact number a candidate need to enter their available time at home where the candidate can be available on the phone instead of his family members. Therefore, it is always better to make sure that while entering a home contact number a person need to provide his available hours at home to avoid unnecessary delay in conveying the important messages. There is a possibility that the candidate might have given his cell number in their resume, but because of bad network the employer might not reach the candidate. Therefore, to avoid such situation the candidate need to provide a cell number with a good network connection and change their bad network providers for their better communications availability anywhere and anytime. 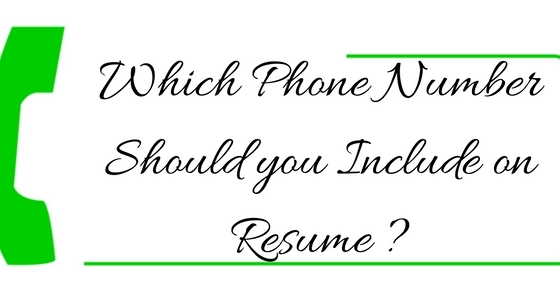 Finally, the bottom line is that with the help of discussion over which phone number should one person put on their resume, a candidate can make his decision easily by reading and following all the given tips about choosing a correct phone number which can be included in the resume. Therefore, this discussion helps all the interested candidate with their resume writing, especially with their personal information and contact detail inclusion. Previous articleHow to Include Volunteer Work on Your Resume?